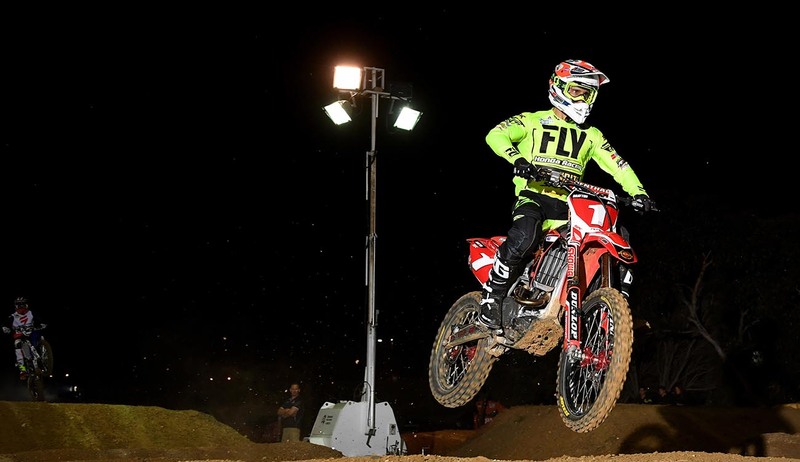 Brayton took his third victory in row and extends his point lead in the 450cc class. Brayton rode faultless, leading all 20laps and looks forward to competing in the up and coming Aus-X-Open (Round 4 and 5 of the Australian Supercross Championship). “I am really happy for the team and our sponsors, it’s been a massive effort and this is reward for their commitment to our program. The Honda has gated well all season and to get another Holeshot is testament to the motor in the 2017 CRF450R”. Jesse Dobson was impressive in the opening laps of the 450cc final. He maintained 4th until he crashed at the halfway mark. He resumed the race in 11th and worked his way back to 8th. “I am bummed I crashed again, I felt comfortable in 4th, its really disappointing as I believed I could have raced for a podium”. Gavin Faith came into the weekend not riding his motorcycle since the last round. Faith was resting his wrist following a heat race crash from the heat race in round 2. In tonight’s final (round 3) he came together with another rider following a troubling start. He worked from outside of the top ten into 5th and maintains the points lead going into Aus-X-Open. “I gated poorly tonight and it made things really hard on this track as it was slick and very one-lined. I had to come from quite a ways back and I ended up getting tangled up with another rider midway, I really made things hard for myself. I have another two weeks to prepare for the indoors and I am looking forward to racing in Sydney. I am just glad I got through this weekend in one piece and still in the championship points lead”.